Northmor High School’s show choir, Knightsounds. GALION — Northmor High School’s show choir, Knightsounds, along with the Northmor Music Boosters, presented a special dinner show on Saturday, March 24. The event was titled “Memories Through the Decades” and included selected students performing such memorable selections as “Desperado”, “Imagine”, “The Way You Look Tonight”, “In the Wee Small Hours”, “Breakaway”, “Blackbird”, “Can’t Help Falling in Love”, and “Bridge Over Troubled Water” during the meal catered by Olive Garden. Knightsounds members also presented a tap dance to “I Got Rhythm” and a special swing dance to “I’m Still Standing” from the movie, Sing. A Silent Auction to benefit the Alzheimer’s Association was held during the event as well. Easter baskets, Northmor Golden Knight pillows, beauty baskets, Olive Garden gift cards (plus $100 donation), special quilts and warming packs were made available for bids. A total of $1,300 was raised through the silent auction alone and the total donation amount towards the Alzheimer’s Association was $2,000. The meal was served to 300 attendees by the Junior High Honors Choir members and their parents along with the music boosters. The Knightsounds then performed their 2018 show featuring “Faith” by Elton John, “When You’re Home” from In the Heights by Lin Manuel-Miranda, “You Will Be Found” from Dear Evan Hanson, and “Footloose” from the popular 80’s movie of the same name. The Junior High Honors Choir joined the Knightsounds on stage for the final number, “Stand in the Light.” The group is under the direction of Mrs. Dana Ruth with assistant Miss LaNeta Wertz. 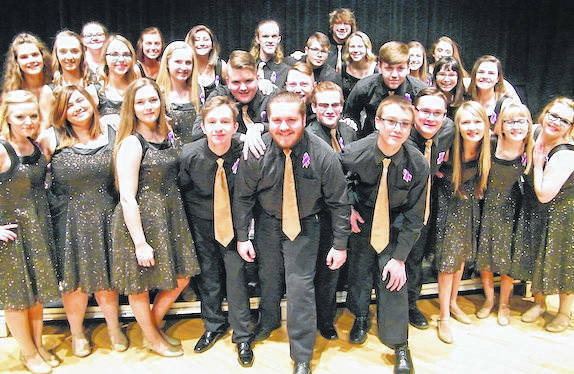 https://www.galioninquirer.com/wp-content/uploads/sites/38/2018/04/web1_northmorshowchoir.jpgNorthmor High School’s show choir, Knightsounds.